Last week was a literary week for me.Literally. On Monday I attended the Ekamra Book Festival(read book fair) at Janta Maidaan (no clue why such a name was chosen, wait Pragati Maidaan rings a bell)which didn’t have too many stalls(as usual) but it’s absence was more than made up by chatty enthusiastic booksellers (interspersed with morose booksellers who couldn’t give a damn about what book you were looking for),who made informed suggestions and made buying books enjoyable and a second hand book store(the one and only) from where I found these books. And the company of a friend who is also a bibliophile as well as a close friend(a devastating combination-swoon worthy) made it all the more better. I had gone with a promise to myself that I won’t buy books not on my list (to stop overspending as well as overpopulating my house,more like inundating it with books, as my mother would say pointing an accusing finger at me) and having a friend around helped me keep a check although she did suggest the book on the top by Tagore and I got it.Who can say no to Tagore. And at the bottom is a much loved classic Black Beauty by Anna Sewell translated into Odia. On a/an (un)related note,why are the books we read in school so enduring? 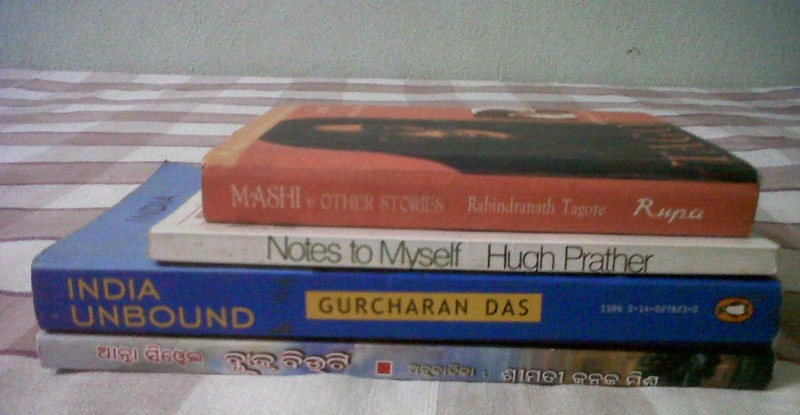 Then the day after I attended a few sessions of the third edition of the Odisha Literary Festival with my friend. I was excited and had been keeping a tab on it since attending it last year.I found some like minded people to discuss stuff as the events were unfolding. Hence it was more fun taking potshots, cracking jokes, forming an admiration society, discussing the merits and demerits of having read an author on the dais, running for a chat with a favourite author, shoving a large crowd to get an autograph or being bored out of our minds and being clueless for not being able to follow the discussion,for that matter. made me feel at home. Ebooks could not provide the comfort I craved for (Stephen King’s On Writing was an exception) and until I stepped into the bookstore and let my senses feast on the vast expanse of books in front of me I knew this was what I was missing. 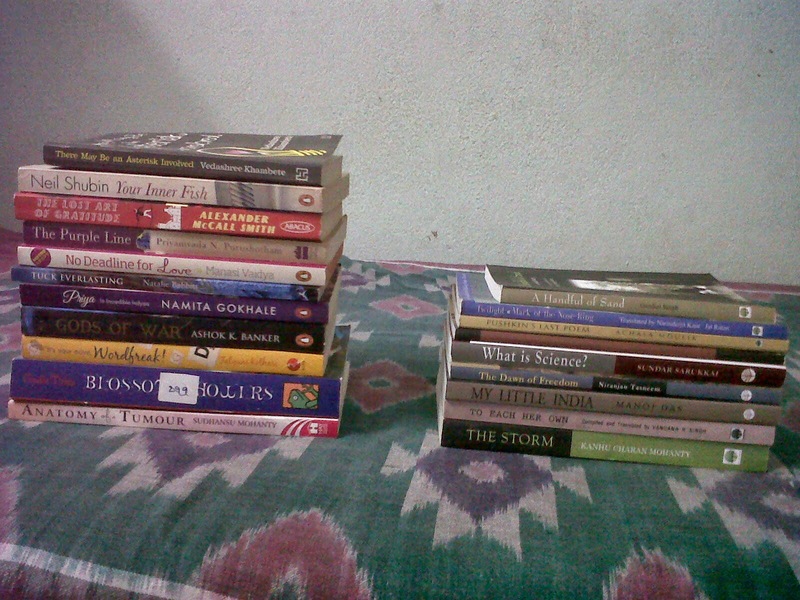 Ladies and gentleman, behold my Delhi book haul (the left pile from Landmark sale and the right pile from National Book Trust’s shop on their premises) minus the books for children which cannot be shown in a pile and the hard bound books,which I had stuffed in my bag so they came home with me. It would seem like a bit too much(my father casually asked how many books I had bought bracing himself to hear the number) but I am going to open a library (unofficially it’s already in action)someday.So it’s an investment (at least that’s what I tell myself and others who question my buying habits) for the (near) future. All in all a pretty good week for me. I’m already looking forward to the book fair and the literature festival in December. As I told my mother the other day so what if I can’t buy,I can just browse,right? She didn’t look quite convinced and sighed.